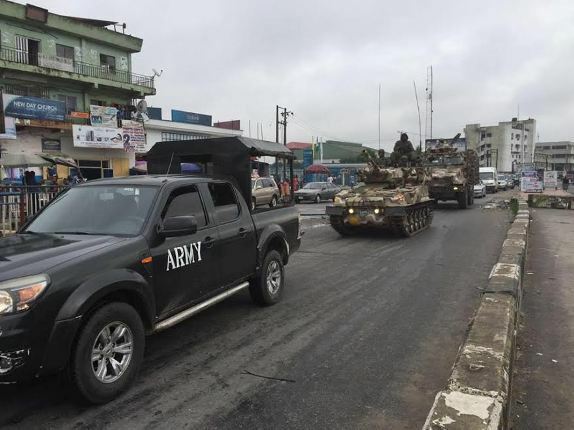 Home Biafra Nigeria Top News Nigeria military build up in the Southern part of Biafra: Nigeria is on the brink of another full-blown war. Nigeria military build up in the Southern part of Biafra: Nigeria is on the brink of another full-blown war. There are fears that Nigeria might witness a major strife, which may even compromise the unity of the country if the federal government goes ahead to declare war against the Niger Delta militants, writes MIKE UBANI, in Port-Harcourt. Few days ago, President Muhammadu Buhari issued a stern warning to the Niger Delta Avengers (NDA) and other militant groups in the volatile oil-rich region to embrace dialogue or face military action. The President warned that his administration would not continue to watch helplessly as a few aggrieved persons destroyed the country’s oil infrastructure when the is­sues at stake could be resolved though dialogue. Indeed, the NDA and other militant groups operating in the region had in the past few months destroyed critical oil and gas infrastructures in the area, thus jeopardizing the country’s already dwindling economy. According to the Governor of the Central Bank of Nigeria, (CBN), Mr. Godwin Emefiele, the country loses N107 billion daily due to the vandalization of oil and gas pipelines by the NDA and other militant groups operating in the Niger Delta. It was apparently against this background that a dis­traught President Buhari warned the militants of the consequences of continuing in their nefarious activities. He warned that the Federal Gov­ernment would use the force of arms to literally drag the militants out of the creeks, al­most the same way they dealt decisively with the marauding Boko Haram terrorists in the scorching North Eastern part of the country. President Buhari said the Federal Government was open to dialogue with the Ni­ger Delta militants to resolve all contending issues in the oil-rich area. ‘‘We do not believe that they (militants) have an­nounced a ceasefire. We are trying to understand them more; who are their leaders and which areas do they oper­ate and other relevant issues?,” said President Buhari. The President who spoke duringa bilateral talks with the Japanest Prime Minis­ter declared that if the Niger Delta militants refused to negotiate with his government, he would crush them the same way he crushed Boko Haram. He further told the Japa­nese leader that with the defeat of the Boko Haram terrorists by the military, the attention of the administration was now focused on stopping the destruction of the country’s economic assets by militants in the Niger Delta region. “We are talking to some of their leaders. We will deal with them as we dealt with Boko Haram if they refuse to talk to us. “As a government, we know our responsibility which is to secure the environment. It is clear to us that lenders won’t fund projects in an insecure environment,” said President Buhari. Even before the President asked the militants to accept the option of dialogue or face military onslaught, the Nige­ria Army had readied itself to march to the creeks of Niger Delta to forcefully fish out the militants..
“We need to keep our coun­try safe. We need to get our economy going without any interruption”, said the army boss. Gen Burata was opti­mistic that at the end of the exercise, security would have been achieved in the tempes­tuous oil rich region. “ We hope that the econo­my will come up again and the facilities and infrastruc­tures in terms of the oil and gas will be protected and the people around will go about their normal businesses with­out fear of any attack,” said the army chief. It will be recalled that “Op­eration Delta Safe” was set up by the military during the pre­vious administration to also quell the resurgence of mili­tancy in the Niger Delta. Apparently conscious of the consequences of a full-blown war in the Niger Delta region, many organizations and indi­viduals had since appealed to the militants to sheathe their swords and accept the option of dialogue. For instance, The South-South Peoples Conference (SSOPEC), a socio-cultural group in the region, had ap­pealed to the NDA and other militant groups to dialogue with the Federal Govern­ment..
Prof. Sotonye Amakiri, chairman of the association and other leaders of the group drawn from the six states of Rivers, Bayelsa, Akwa-Ibom, Cross River, Delta and Edo, said at the end of its recent meeting in Port-Harcourt, the Rivers State capital, that it was better the militants discussed with the Federal Government instead of going to war with the Nigerian Army..
“The militant groups should not ignore the Federal Government’s willingness for dialogue,” said Amakiri. He pointed out that nego­tiation was paramount as it would enable government to understand their demand challenges. A chieftain of the ruling All Progressives Congress (APC), Dr. Ben Nwoye, also said in an interview with The AU­THORITY in Port-Harcourt that dialogue was the best op­tion to resolve the Niger Delta crisis. He advised the Buhari-led administration to acquaint itself with the Amnesty Pro­gramme initiated by the gov­ernment of late President Musa Yar’Adua, to see whether it could be fine-tuned to meet the demands of the region. Governor Ifeanyi Okowa of Delta, and his Sokoto State counterpart Hon. Aminu Tambuwal, had equally urged the militants to dialogue with the Federal Government. Both governors said in Asa­ba during the just concluded 25th anniversary of the crea­tion of Delta State that an at­mosphere of peace would fast-track the development of the oil rich region. Though a faction of the militant groups has reportedly agreed to dialogue with the Federal Government, indica­tions are that it would take some time before a consensus is reached among the militant groups to pursue the path of peace. The country had fought a civil war between 1967 and 1970, after the then military governor of former Eastern Region, Col Chukwuemeka Odumegwu Ojukwu, now late, declared the region the Republic of Biafra on May 30, 1967. According to a report is­sued by the United Nations,the war which lasted for 30 months, claimed the lives of two million people, especially women and children. “Nigeria cannot afford to fight another civil war, but if it does, it may lead to the disin­tegration of the country.” said Iwenso. An environmental activist in the Niger Delta, Comrade Alagoa Morris, told The AU­THORITY in an interview that the militarization of the Niger Delta region “can never be the best option for sup­pressing the militants in the region. He rather advocated for the declaration of a state of emergency in the region that will be geared towards devel­oping the area..
“If President Muhammadu Buhari feels that increasing military presence in the Ni­ger Delta region that has been militarized since 1999 will be the only option to solve the Niger Delta issue, he should go and ask Obasanjo whether that military option was effec­tive or not. “According to students of management, every leader has his own style in pursuing goals of the organization, so I can­not choose for Buhari. How­ever, I would like to remind the Federal Government of certain very important histor­ical facts, when visionary lead­ers like Ken Saro Wiwa saw the coming war in the Niger Delta and urged Nigerians to do something before the cur­tain falls, the then leadership of the country failed to see, but rather killed him.,” he said. He said it will be difficult if not impossible for the Nigeri­an military to fight a success­ful war in the creeks of Niger Delta. “While not encouraging militancy in any way, I wish to remind residents that Ni­geria is sailing in a democratic dispensation and, it is far bet­ter to jaw-jaw than take up arms against each other. Un­fortunately former President Yar’dua is late, I would have urged Buhari to go and learn from him”. Morris also urged the Fed­eral Government to go back to the report of the Technical Committee on the Niger Delta and implement recommenda­tions therein, pointing out that If Boko Haram that killed fel­low Nigerians in thousands without any positive reasons are now enjoying protection and the North East is given special attention, there is no reason why the Federal Gov­ernment should not declare a state of emergency in Niger Delta with the main focus of developing the area. He said: “Look at the Brass road which even IBB said he will complete in 30 months; it is still in limbo. Are they seri­ous with our development? Even politicians from our re­gion are looting the common­wealth and under- developing us. This is so sad and unfor­tunate. Nevertheless, the fiery civil society activist and founder Africa Network for Environ­ment and Economic Justice (ANEEJ), Rev. David Ugolor, accused the Federal Govern­ment of lacking strategic plan to develop the Niger Delta re­gion, saying the many years of neglect of the area has forced the youths to take up arms against the government. . The groundswell of opinion here is that the unity of the country will be seriously af­fected if the Federal Govern­ment declares war against the militants of the Niger Delta. “Nigeria may not be the same again if there is war in the Niger Delta”, says Chek­wube Isioma, an undergradu­ate in one of the universities in the South-South region.